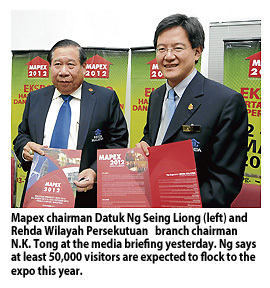 The annually-held Malaysia Property Exposition (Mapex) will see the participation of foreign property developers for the first time this year. Mapex chairman Datuk Ng Seing Liong said up to five foreign property developments in Thailand, Australia, the UK and the Philippines are likely to be featured at the event to be held from March 2 to March 4. To date, companies with projects in Thailand and the Philippines have registered to participate and the organiser, Real Estate and Housing Developers' Association Malaysia (Rehda), is still awaiting confirmation from the Australian participants. The Thai company will be promoting a property development in the UK as well, he told a press conference here yesterday. Ng said at least 50,000 visitors are expected at the event, themed "Home and Abroad", which will be held at the Mid Valley Exhibition Centre and "we expect thousands of transactions to take place". Mapex brings together a wide range of innovative property development, priced above RM240,000, from those under construction to completed projects, as well as offering financing packages for potential purchasers and investors. He said Mapex will be a useful platform for international participants to showcase their projects to the Malaysian public apart from giving them the opportunity to meet top Malaysian developers. As for the local players, 81 companies have confirmed their participation showcasing more than 300 housing developments, including Sime Darby, SP Setia, Mah Sing, Malton Bhd, IJM Properties, Lebar Daun Development, Naza TTDI, I&P Group and a few more. Ng said the property market in Malaysia is still a sustainable industry and based on the country's population, 100,000 new houses are needed annually. "And Klang Valley is still where the property market is most active, followed by Penang and Johor Baru," he said. He added that the trend among Malaysians is still towards properties that are landed and in the urban areas, but "these properties are getting scarce and becoming more expensive". Meanwhile, the second national-level Mapex will be held from October 19 to October 21. PROPERTY developer Dijaya Corp Bhd aims to launch RM1.1 billion worth of projects this year after accumulating land for development in the past 18 months. Last year, the master property developer of Tropicana Golf & Country Resort and Tropicana Indah Resort Homes in Petaling Jaya only launched RM700 million worth of properties. 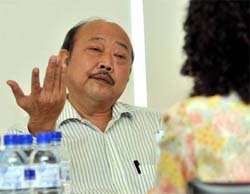 "For 2012, we are targeting sales between RM650 million and RM700 million. It is a conservative target but we hope to achieve more than that," Dijaya managing director Datuk Tong Kien Onn told pressmen after the company's extraordinary general meeting in Petaling Jaya yesterday. 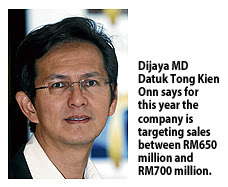 Last year, Dijaya sold about RM420 million of properties. "Dijaya will be launching many new projects this year and next year on lands that we have purchased over the last one-and-a-half years. "The total gross development value (GDV) of these lands works out to around RM28 billion," said Tong, adding that the group's total undeveloped landbank area is 324ha. Among the projects in the pipeline this year are within its flagship Tropicana project in Petaling Jaya as well as in Subang, Cheras, Johor Baru and Penang. In the third quarter this year, Dijaya will be launching two new projects in Tropicana Indah Resort Homes, namely Golf Villas and Tropicana Gardens. The RM1.8 billion Tropicana Gardens commercial centre features SoHo units, offices, service apartments, offices, a hotel and lifestyle retail space. Dijaya aims to develop 5.6ha of the lakefront project over a period of between six to eight years, and the first phase will involve RM200 million GDV. In Subang, Dijaya had bought 35.4ha for RM385.5 million in 2010 with plans to build three-storey link, semi-detached and bungalow houses, condominiums as well as commercial development. Dijaya aims to make a huge footprint in Johor's property market with the second project called Tropicana Danga Cove with a total GDV of RM2.8 billion. The construction of the 10-year project is targeted to commence by first half of this year. On the horizon, due to the limited landbank within the Tropicana development, Dijaya has plans to develop bungalows, link houses and semi-detached units at Tropicana Cheras and Tropicana Balakong. The acquired landbank in Sungai Long, Cheras and Balakong have an estimated GDV of RM185 million and RM400 million, respectively. Yesterday, shareholders of Dijaya approved the company's plans to enter into a joint venture with Ivory Properties Group Bhd to buy and develop a 41.02ha site in Bayan Mutiara, Penang. Tropicana Ivory Sdn Bhd, 51 per cent owned by Dijaya, will invest RM10 billion in a mixed residential and commercial property project that will keep the company busy for eight to 12 years. KUALA LUMPUR: The property market is expected to see 10 per cent growth in transaction value this year from over RM40 billion last year, according to property consultant CH William Talhar & Wong Sdn Bhd. Managing director Foo Gee Jen said the growth is slightly lower compared to 11 per cent last year, adding the appreciation in market value is mainly driven by cost rather than demand. "The higher land value, shortage of labour and rise in building material prices rather than buyers' demand prompted our forecast value," he said. He said the property market would stay buoyant on the back of the strong housing property segment, with the growth mainly contributed by demand from the young population. Speaking at a media briefing on the outlook for the property sector today, he said office rentals would remain stagnant or decline for older buildings but there would be higher asking rentals for newly completed buildings with green certification and Multimedia Super Corridor status. With over 0.74 million sq m of new office space expected to enter the market this year, there will be a very competitive office leasing environment, he said. "Hence, older buildings will face pressure from declining occupancies as tenants seek newer, better quality offices," he added. For the condominium sector, Foo said luxury condominiums could face the threat of oversupply in the future. On new non-landed developments, he said a total of 13,716 units in 47 developments are currently under construction, with about 2,900 units to be completed this year. "With the average occupancy rate at 68 per cent, this gives some pressure on the developers, whose current focus is more on smaller and more affordable unit sizes of 46.5 to 93.0 sq m," he said. Selling prices range from RM9,136 to RM21,520 per sq m in the KLCC area, and RM7,532 to RM10,760 per sq m in the Mont' Kiara/Sri Hartamas and Kenny Hills areas, he added. However, he said, sales of new housing developments are expected to be sustained this year due to the low interest and unemployment rates and attractive financing packages. He said the take-up rate will be maintained at last year's rate, with the House Price Index at 11.4 per cent for Kuala Lumpur and 9.6 per cent for Selangor. "Last year, the landed residential sector showed strong movement on the supply side while demand was correspondingly positive, with most new launches recording high sales rates of between 60 and 70 per cent," he added. The Bukit Gambang Resort City, which has a gross domestic development value of RM1.8 billion, will be fully developed by 2018, says its developer Sentoria Group Bhd. The resort city, which opened its doors two years ago, currently has a water theme park but more attractions are expected to be added soon. 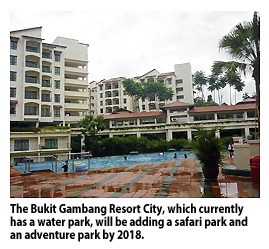 "We are looking at adding a safari park, an aquaria and an adventure park, " said Sentoria Group Bhd joint managing director Datuk Gan Kim Leong after securing a grant of RM6.9 million to develop the second phase of the Bukit Gambang resort city yesterday. He said the company was looking at starting work on the Bukit Gambang Safari Park as well as additional development under the Arabian Bay Resort, which has an estimated investment value of RM140 million. On Sentoria's initial public offering, he said the company was expected to raise RM51.6 million, of which RM27.7 million would be allocated for working capital, RM11.2 million for repayment of bank borrowings, RM9 million for purchase of properties, plant and equipment and the balance RM3.7 million to defray listing expenses. Applications for Sentoria's IPO will be closed at 5pm today and the company is expected to be listed on the Main Board in the first quarter of the year. Big and bold: The Wharf Residence entrance. CONVERTING and redeveloping an ageing light industrial area into an upmarket resort-inspired residential and commercial enclave is an arduous task, but not an impossible one. Bolton Berhad, one of Malaysia’s oldest property developers, has proven in its transformation of the 140ha Taman Tasik Prima Puchong over the last 10 years. Taman Tasik Prima has emerged as one of the preferred townships in Puchong on the strength of Bolton’s meticulous planning and innovative product offerings. The commercial component of the township, The Wharf — a fusion of modern architecture, green and water elements — is set to be the showpiece of suburban Kuala Lumpur. This integrated 3-in-1 commercial development is located at the fringes of a tranquil 81ha lake. Comprising lakeview apartments, boutique showroom offices and a lifestyle mall inter-connected by intricate, contemporary and environmentally-driven architecture and design, The Wharf is set to transform the former light industrial area into a vibrant mini metropolis and live up to its promise of being the “Neighbourhood Lifestyle Des-tination”. Bolton’s versatility and innovation has already received international recognition as The Wharf won an award for the Best Mixed Use category for Malaysia at the Asia Pacific Property Awards 2011. An important factor leading to the impressive take-up rates at Taman Tasik Prima is Bolton’s track record in creating value and capital appreciation for its customers. When Bolton began developing Taman Tasik Prima, the plan was to achieve RM500mil in gross development value (GDV). Today, Taman Tasik Prima’s GDV is in excess of RM1bil, with The Wharf commercial development itself being valued at more than RM500mil. The Wharf is sited on a 6ha tract of commercial land fronting Tasik Prima Puchong and flanked by existing prime landed properties as well as the Bizhub shopoffices. The project was officially launched on Aug 20, 2010, with the BizWalk comprising 32 units of three-storey boutique showroom offices being the first product to be offered. With a minimum price tag of RM2.2mil and a GDV of RM81mil, BizWalk which boasted a unique design of 25ft wide frontage and each floor being a ground floor, was sold out almost immediately. 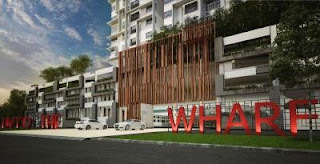 Its second product offering, The Wharf Residence was launched on Nov 12 last year. Tower 8, the first block comprising 334 units offering built-up areas ranging from 795sq ft to 1,173sq ft, was designed with practicality and functionality in mind. The lakeview apartments offer stylish and comfortable living spaces within a distinctive environment which offer full condominium facilities. 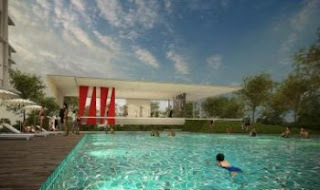 Well maintained: The swimming pool is one of the many facilities available at the Wharf Residence. One of its unique features is the large external storage room for each unit, located on the respective floors, which is something that has not been offered before in the Puchong area. Tower 8, which has GDV of RM120mil, is now 85% sold. The second tower, Tower 18, is now open for registration. Due to the tremendous response of BizWalk, Bolton launched an innovative 2-in-1 commercial offering called “Flexi Suites” located on Levels 4 and 5 of BizWalk. The 64 units strata offering is designed to suit the business and lifestyle needs of its intended market, where the owners have the flexibility of renting out, occupying or doing both, hence the 2-in-1 tagline. With an entrance foyer for every unit, and linked to the multi-storey car park giving each unit the feel of being a ground floor unit, the Flexi Suites are also receiving a tremendous response. The upcoming The Wharf Retail Mall will further strengthen the appeal of The Wharf Residence, BizWalk and Flexi Suites. The mall, which has 1,296 parking bays, is expected to be completed by 2013. There would be a link bridge from the apartments to the mall, providing integrated convenience to residents. The Wharf Retail Mall is one of very few malls fronting a lake, and there is ample promenade space for events and alfresco dining. The mall has already received many enquiries from potential anchor tenants. This year, the company also plans to launch “Summerhomes”, its last landed lakeview residential development which comprises 58 units of three-storey townhouses and four units of 2½ semi-detached houses with a GDV of more than RM45mil. Developments around shopping centres tend to appreciate in value due to the convenience, and by virtue of it being located next to The Wharf, Summerhomes is expected to be another hit for Bolton. JOHOR BARU: Johor Baru's coastline fronting Singapore is in for a major transformation that will have a gross development value (GDV) of some RM80bil and led by a joint venture between the Johor state and businessman Datuk Lim Kang Hoo. The straight-talking Lim, who granted StarBiz an interview after numerous calls were made to his office, also didn't rule out the listing of IWH. “We are still preparing for it ... One day it will be listed,” he said at his modest office in downtown Johor Baru. “It's a misperception. This is a consolidation exercise to put all the landbank into the holding company. In the end, what KPRJ will have is joint ownership of a much larger pie than what it had before,” he said. The company has attracted developers such as Dijaya Corp Bhd, Singapore's Azea Residences, Plazzo Hotels & Service, Waz Lian Group, Tune Hotel and Australia's Walker Group. It has been reported that Dijaya has committed to invest RM3.8bil to build a high-end mixed development while Singapore's Azea Residences will work on four blocks of high-end apartments at a cost of over RM500mil. Australia's Walker Group has also partnered with IWH to develop Senibong Cove into a high-end residential development modelled after the Hope Island project in Australia's Gold Coast. PETALING JAYA: Property developer Hua Yang Bhd is setting aside RM100mil to go on a landbank acquisition spree for its financial year ending March 31, 2013, and is aiming to develop projects worth RM800mil to RM1bil in gross developmental value from the land acquired. “We have set aside RM30mil of our own internal resources as capital expenditure, and is planning to raise another RM100mil to support our plans for land acquisition,” said Hua Yang chief executive officer Ho Wen Yan. However, he said the company had not decided on the specific exercise to raise the amount needed. Ho said the company spent only about RM56mil last year to expand its landbank as land sales were difficult to complete as bullish market sentiments held back buyers who were holding out for a better price. “I hope to secure more land this year, and the money we intend to raise would definitely be done by 2013,” he said. Besides targeting more land in Penang and Perak, the company is also eyeing land in east Malaysia, especially Kota Kinabalu, Sabah. Currently, the company has a total landbank of 787 acres worth a gross development value of RM2.4bil. Speaking on the outlook of the property market, Ho said the affordable housing sector would still remain strong driven by demand of for properties ranging RM400,000 and below. “While other segments of the market might experience some softening especially high end areas in the Kuala Lumpur city centre, and also pockets in the Klang Valley where prices had gone up quicker than the others,” he said. For its nine-month period ended Dec 31, 2011, the company achieved a net profit of RM39.9mil, an increase of 136% from RM16.9mil when compared with the previous corresponding period. Revenue grew by 82% to RM222.1mil from RM122.1mil previously. The company is set to deliver another record year as its financial performance for its nine-month period had surpassed what was achieved for the full financial year of 2011. “Investors can expect better dividends than last year, as based on current results, 2012 will be better than the previous year,” he said.